Our choice of the theme "Non-violence" for "Art on the Net" this year prompted us to drop the conventional competition style. 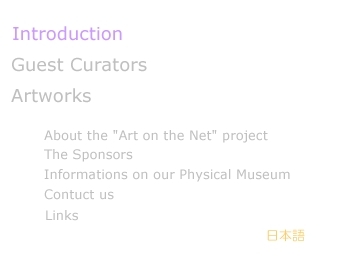 Instead, we decided to commission five female guest curators - DeeDee Halleck, Shu Lea Chang, Honor Hager, Elisabeth Zimmermann and Olga Shisiko - to explore the World Wide Web and collect the sites that support their interpretation of the theme. The compiled list proved rather limited in the variety of countries represented, with the absence of Asia and African countries and Islamic regions. This project, however, was not intended to present a global site map of non-violence. The five women with deep involvement in media activism and media art made the selection based on the site's view on non-violence in relation to the Internet. Comments made for each site should tell why it was selected. This year's theme has an obvious link to the war in Iraq and the post-9-11 situation. I took these two incidents so seriously that I thought the conventional style of competition would no longer serve the purpose. Giving up all forms of competition is a way to protest against the situation where dichotomist war takes place with the world participating either as an ally or a foe and where ways to efficiently kill people and defeat the opponent are pursued so openly. In Japan today, competitive principle, which has been kept on a leash for decades in the post-war period, is now let go of and is put on a pedestal. Winning debates and earning high merit-based remunerations are considered more proactive and new ways of lifestyle. The state, too, is transforming from a nation that renounced war to one that is capable of bringing on a war. Turning to technology and media, I think softer and subtler mechanism of violence than visible atrocities, such as wars and murders, are proliferating uncontrollably. Or maybe explicit forms of violence as wars and murders are covering such advancement and proliferation of subtle control of technology. Just as military expansion made significant progress during the time of detente, explicit forms of violence may be discreetly underpinning the emergence of soft violence behind them. The Internet, with the kind of relationship it is progressively having with us, close to our "nerve cells," is building the potential of revealing and criticizing such mechanism of violence. I sincerely hope that this attempt in "Art on the Net" will contribute to the formation of virtual nerve mechanism that sensitively detects such violence.